If GitHub is your main development tool, it may be helpful to have those new issues push directly into your productboard. To set up your GitHub integration here's our article for GitHub issues. Send me directly to Zapier! You can give this ready made zap a try here! 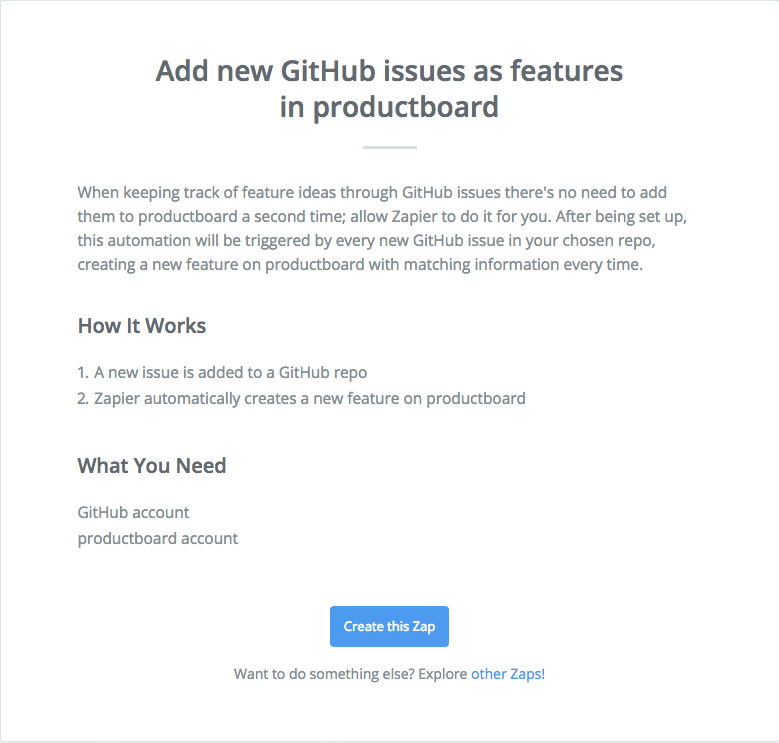 With this zap, your new GitHub issues will be zapped into productboard as new features! At this time, any issues imported from GitHub will not remain in sync. So changes made to associated features in productboard will not be reflected in GitHub, and vice versa. However, if you use productboard's native GitHub integration to push features from productboard into GitHub, features and issues will remain in sync. If, in the future, you push these productboard features into GitHub that were originally imported from GitHub via Zapier, they will not automatically merge with the original GitHub issues. Instead, duplicates will be created. As a result, consider deleting GitHub issues that you've already imported into productboard. You'll be able to push them back into GitHub down the line with the native GitHub integration. Relax and watch your GitHub issues stream into your productboard! Want to customize the zaps linked above? Create a zap of your own! We support OAuth, so there's no need to mess around with API Keys.